SERANG, Indonesia, Dec. 27 (Xinhua) -- As the possibility of new tsunami in Sunda Strait of western Indonesia remains high, authorities have prepared evacuation plans and designated shelter areas for locals residing in coastal areas vulnerable to tidal waves. The Indonesian volcanology agency raised the alert of Anak Krakatau volcano in Sunda Strait to level III, the second highest, due to fresh volcanic activity that may lead to another eruption. The eruption on Dec. 22 triggered a deadly tsunami in coastlines along Banten and Lampung provinces. The danger zone around the rumbling volcano was expanded to 5 km from the 2-km radius since Mt. Anak Krakatau increased its activity in July. Collapse of the volcano's undersea wall resulted in the tsunami on Dec. 22 evening that killed hundreds of people who were spending the weekend in popular beaches along Banten's coast. As the danger of another eruption persisted around the tourist destination, authorities have prepared shelters and evacuation procedures to accommodate tens of thousands of local residents. "Residents have been informed about locations of shelters in each of their neighborhoods. 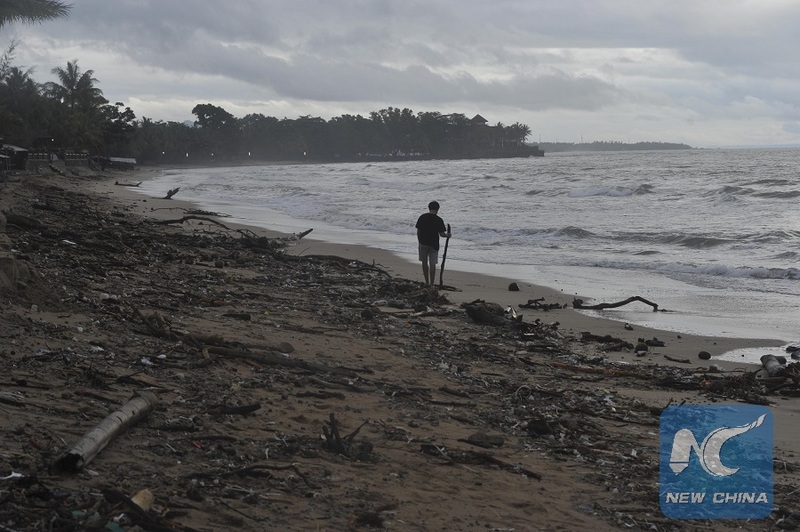 Should a tsunami early warning be issued by related agencies, we will send our personnel to their houses and usher them to the shelters," Rico Sirait, commander of Cinangka district military command in Banten's Serang regency, told Xinhua. Residents have been advised not to drive cars so as to expedite their evacuation to shelter camps, which have been set up in higher ground of 50 to 100 meters above the sea level with a distance of around 1 km from the beach. "They can use motorbikes, but not cars as it will only slow down the traffic of evacuees toward the shelters," said Rico, who heads the relief distribution and a search team center. After assessment of impacts of Saturday's tsunami in the area, the shelters were considered safe for the possible evacuees. "As long as the tsunami is not generated by an earthquake, the shelters are good enough to address the public's safety," Rico added. Apart from carrying out search and rescue operation, the center has distributed food and basic necessities to the displaced. Rico said some survivors did not like to live in the tents provided by authorities as they prefered to stay with their friends or relatives in safer locations. "That is why we drop the aids to village offices based on data of people affected by the tsunami in each village. They will pick the relief from the village offices," he added. The health service section in Cinangka search command center has received 15 bodies found around the district and tens of injured ones from around the area. The regency of Pandeglang in Banten province, located further down from Cinangka, is the worst-hit area with the highest death toll of 290. Indonesia's National Disaster Mitigation Agency said the death toll from the tsunami has reached 430 so far. The disaster also left 1,495 people injured and 159 missing. Almost 1,000 houses, and tens of hotels and villas on the beach were severely damaged by the tsunami in Sunda Strait between Java and Sumatra islands. Meanwhile, authorities have distributed masks to people in tsunami-hit areas in Serang regency, who were being choked by volcanic ash from the erupting Anak Krakatau volcano, or Child of Krakatoa volcano. Aviation authorities have also rerouted flights between cities in Sumatra and Java due to thick volcanic ash.